It is right on the edge of the old City center. 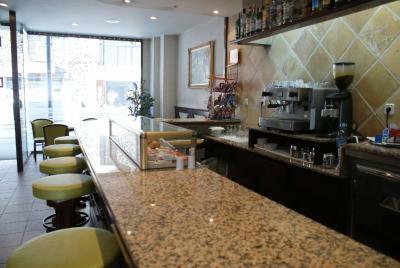 Close to great local restaurants. Very personable staff. Good two night stay. Friendly staff. Good location. Parking in the back. I would probably try a different place when in town. The staff was very friendly and helpful. Breakfast simple but ok. It is worth the money because it is very cheap. My bus from Toulouse brought me to the doorstep of this hotel and picked me up on my return to Toulouse. 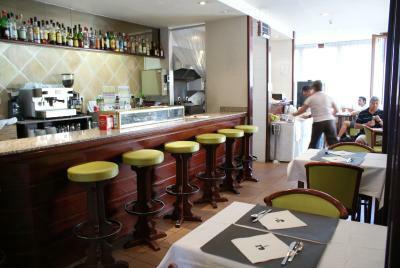 This place is on Andbus (anorrabybus.com) listing for drop-off and pick-up for those coming from Toulouse or Barcelona. 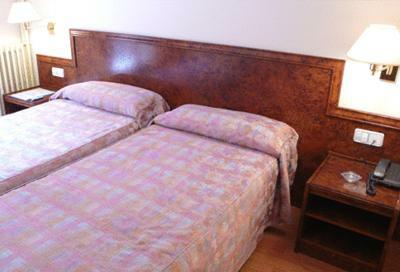 All the tourist sites are within walking distance of this hotel. The place is safe, clean and comfortable. 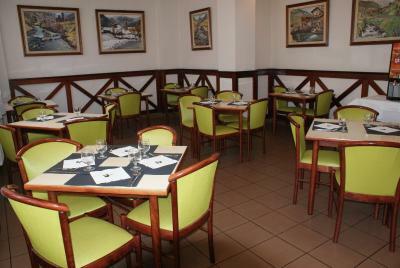 The hotel serves very good meals at reasonable prices. I had dinner here. 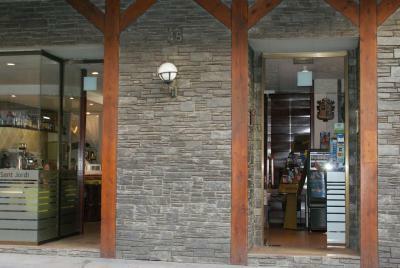 The staffs are also friendly. While I waited for my bus from Toulouse to pick me up, the receptionist rang the bus company to make sure they had not forgotten me. The receptionist even offered me free coffee while I waited for the bus. 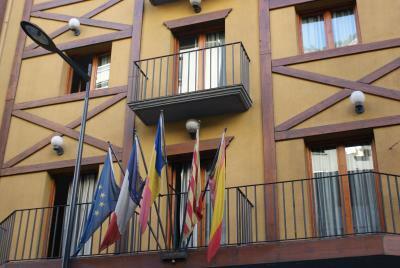 The hotel is located in the historical city center, not in the shopping area. For those who go to Grandvalira it might be a bit far, since you gotta go to the last bus stop (at least it's empty) and then drive all around the city picking up the others. The staff was super helpful and super friendly. The room was small but decent, there was a small TV. 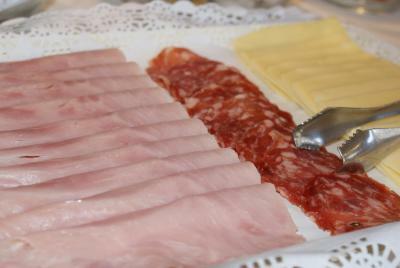 The breakfast was good. 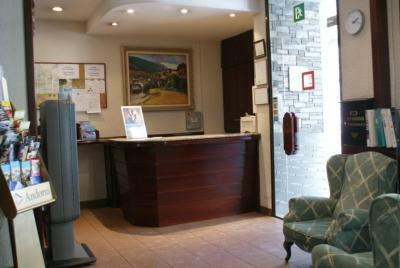 The room itself was comfortable, we were also able to unexpectedly check in early with no problems at all. The beds were very comfortable. We found the location fine, close to what seemed the main bus stop to and from Spain. 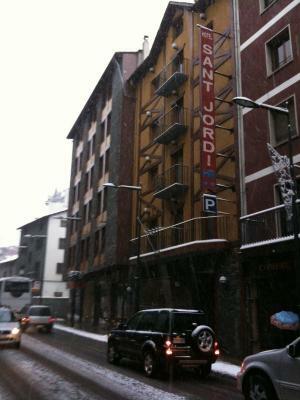 It’s simple and basic for tourists that don’t want to know Andorra and spent no much money. 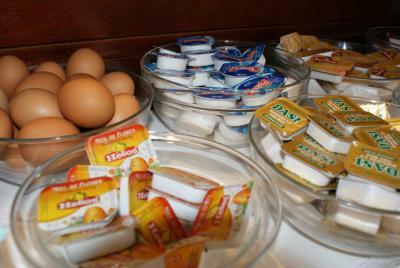 We did not have our breakfast at the hotel as we we're not pleased with the evening meal. The proximity to the shopping area was good not that we came to shop. 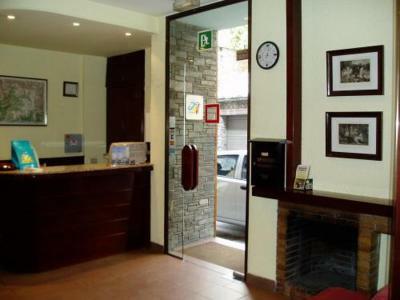 Hotel Sant Jordi This rating is a reflection of how the property compares to the industry standard when it comes to price, facilities and services available. It's based on a self-evaluation by the property. Use this rating to help choose your stay! 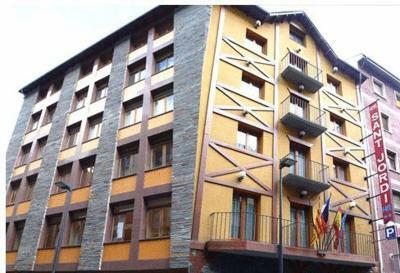 This warm and welcoming hotel is conveniently located in the tourist and shopping center of Andorra, just a short stroll from the Pyrénées Shopping Center. 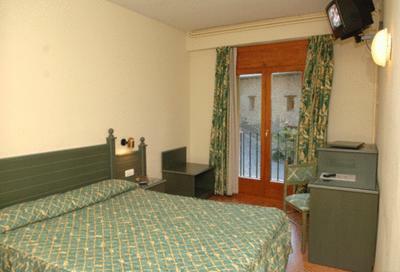 Rooms at the Hotel Sant Jordi are bright and come with their own bathroom and satellite TV. 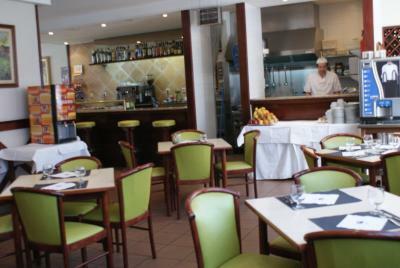 Enjoy tapas and a drink at the snack-bar, and delicious full meals at the Sant Jordi's à la carte restaurant. 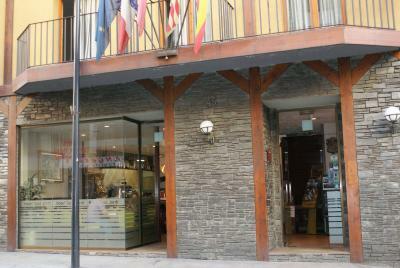 The value-for-money Sant Jordi is the ideal hotel for a duty-free shopping trip or a fun-filled skiing holiday. 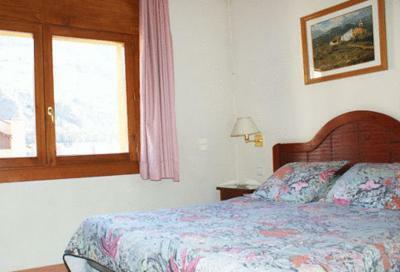 There is a regular bus service to Encamp, where you can take the short Funicamp gondola to the Soldeu, Grau Roig and Pas de la Casa ski resorts. Ask for local tourist and dining recommendations at the 24-hour reception desk, which means you can come and go as you please. 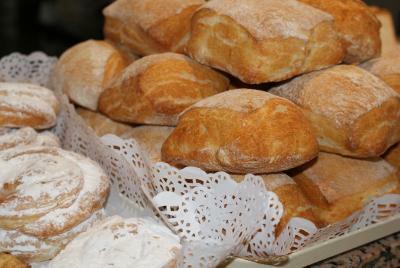 You can also take advantage of the packed lunch service to spend a whole day out on the slopes. 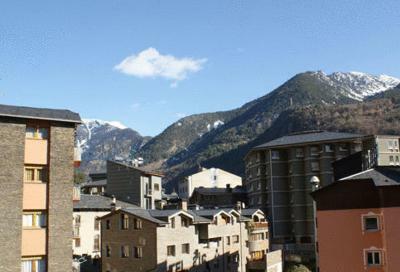 This is our guests' favorite part of Andorra la Vella, according to independent reviews. 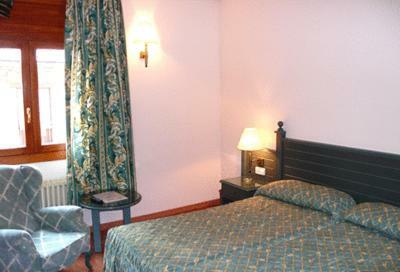 When would you like to stay at Hotel Sant Jordi? 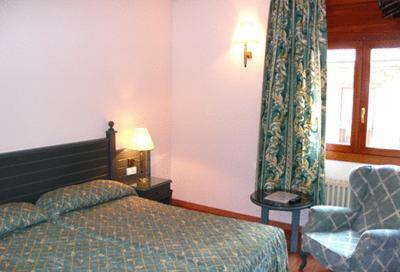 Some rooms offer views of the mountain. Private parking is available on site (reservation is not possible) and costs EUR 12.50 per day. 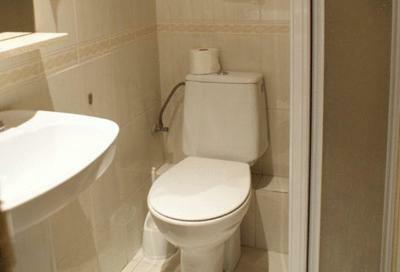 This room features parquet flooring and includes a TV, telephone and a private bathroom. 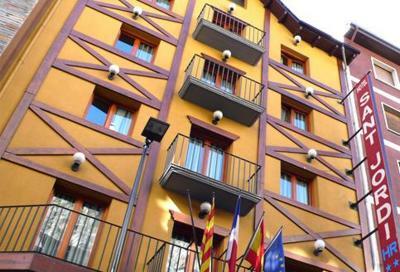 House Rules Hotel Sant Jordi takes special requests – add in the next step! Hotel Sant Jordi accepts these cards and reserves the right to temporarily hold an amount prior to arrival. The bathroom it’s small and uncomfortable! Lighting on the stairway was not available. Why is it in European hotels , the owners cannot seem to get a grip on mold and mildew in their hotels. Very unpleasant. We weren't sure whether we were staying in a hotel or if we accidentally booked a spare bedroom in a house holding a teenage house party. The corridors stunk of smoke and stale beer and all night there was noises of loud music, tv's, shouting, cheering and coughing. When asked for help the staff conveniently didn't understand and continued whatever they were up to at the time. 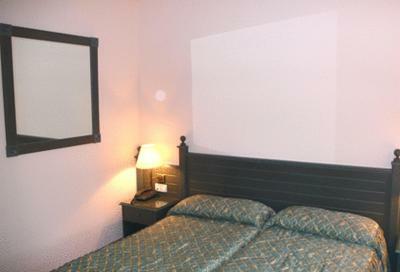 It was in the location in which it was advertised and we were given a double room which is what we booked. Beds were very soft (not in a good way). Good location and price. Hotel was clean. Walls are very thin, so you can hear your neighbours at night. You can ear everything.... very hard to sleep. 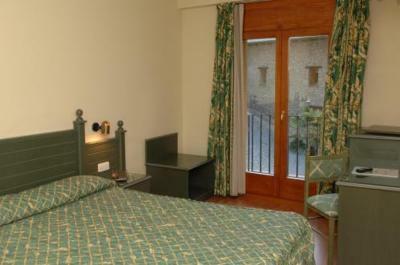 Rooms are not so modern and you can see some cracks on the walls, stains on bed sheets. Clean and comfy rooms. FOH staff was always friendly and ready to help. cozy room even though very old fashioned furniture and linen; good value for money!